Home > Professional Sports > Who Will be the NBA MVP? With the NBA Playoffs kicking off on April 14, 2018, fans can’t wait to see their favorite stars go at it for a chance at the title. 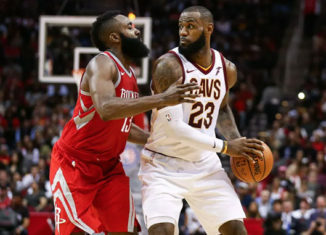 Although the last few years have ended with LeBron James and the Cleveland Cavaliers against Steph Curry and the Golden State Warriors in the Finals, this year is sure to bring some upsets. The Cavs dropped two spots from last year, giving them the fourth seed in the eastern conference. Despite losing all-star guard Kyrie Irving to the Celtics in the offseason, the Cavs completely overhauled their roster and acquired young talent in players like Jordan Clarkson, Larry Nance Jr., and Rodney Hood. The Warriors dropped one spot from last year, giving them the second seed in the West. Although their roster is basically the same as last year, injuries have marked their entire season. All-star guard Steph Curry is out with a torn an MCL and is set to miss at least the first round of the playoffs, with Patrick McCaw joining him. Other players like Andre Iguodala and Shaun Livingston are on day-to-day. Other stars on the team like Kevin Durant, Klay Thompson, and Draymond Green have been out with injuries but have since been cleared to play. With people focusing in on the playoffs, the question of “Who will be the MVP?” is on everyone’s mind. The top contenders for one of the NBA’s most important awards seem to be Damian Lillard, Anthony Davis, LeBron James, and James Harden. Damian Lillard is the starting point guard for the Portland Trailblazers. He’s currently averaging 26.8 points, 6.5 assists, and 4.5 rebounds this season. Not only does Lillard have great solo stats, but he has also led his team to a playoff berth. The Trailblazers currently hold the fourth seed in the West with a record of 48-33. Although the three-time all-star has had a magnificent season, his numbers don’t seem to be enough to get him the MVP trophy. Anthony Davis is the starting power forwards for the New Orleans Pelicans. He is currently averaging 28.2 points, 11.0 rebounds, and 2.6 blocks this season. The former first overall pick in 2012, “The Brow” has turned himself into one of the most feared players in the NBA. He has also turned the Pelicans franchise around entirely, leading them to a 47-34 record and the fifth seed in the West, despite fellow all-star teammate DeMarcus Cousins being out with an Achilles injury. Even though Davis has put up great numbers and led his team to the playoffs, it still might not be enough to earn him the MVP trophy. The final two contenders for the award are seen as the most likely to win the MVP race. LeBron James, or “King James”, is the starting small forward for the Cleveland Cavaliers. The fifteen-year veteran has had one of the best seasons of his career, averaging 27.7 points, 8.7 rebounds, and 9.2 assists this season. Even though the Cavs have dropped a bit in the standings compared to last season, they would be a completely different team without their leader. James is known to improve the play of his teammates when on the floor and has already won the MVP award four times (2009, 2010, 2012, 2013). When asked who he would vote for to be the MVP, James responded with “I’d vote for me”. Despite the numbers, the confidence, and the greatness, most people believe that the MVP will ultimately go to James Harden. The 6’5” point/shooting guard has been on fire the entire season, averaging 30.4 points, 8.8 assists, and 5.4 rebounds this season, along with a shooting percentage of 51.4%. He has led the Rockets to the first seed in the West as well as the best record in the entire league (65-16). Harden is known as one of, if not the best isolation scorer in the league. His stepback, crossover, and hesitation have been known to drop defenders to the floor. Even though other players have had great seasons this year, James Harden should be the top pick for MVP.